Are you realizing the full benefits and rewards of LinkedIn, the world’s leading professional social media network? 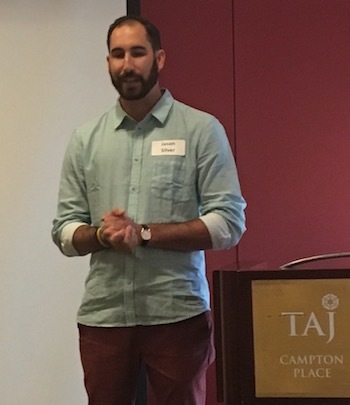 Our April speaker and LinkedIn’s Talent Market Strategist, Jason Silver, ticked off a number of key LinkedIn features that SFPRRT members will want to know about. Profinder located under “Work” on LinkedIn’s Menu bar is a new, professional services marketplace serving freelancers. If you’re a freelancer or independent professional, you can apply to have your business featured on LinkedIn ProFinder. Conversely, if you are looking for a specific service, request a proposal through Profinder. Recruiters rely heavily on LinkedIn to find talent. At any given time, there are five million job postings on LinkedIn. If you’re looking for a job, revisit your LinkedIn profile and check the box that you’re “Open to Opportunities,” signaling to recruiters that you’re available. LinkedIn also takes steps to protect your privacy and keep Recruiter users who work at your company from seeing the career interests that you share. Beef up your LinkedIn profile. Make sure your photo and resume is both current and professional. LinkedIn offers a number of “help” articles to guide you. Build your LinkedIn network. Join interest groups such as industry, alumni and skill-specific organizations. Tip: once you reach 500 connections on LinkedIn, your profile identifies you as having 500+ connections, validation that you are well-connected and a key selling point for career advancement. Start sharing relevant content. LinkedIn is one of the world’s largest content aggregators and creators. Make sure the content is relevant, professional and appropriate to your current position or the next job you want. Coming soon: a revamped SFPRRT LinkedIn group page for you to join and share news, information and resources among members. Thanks to Jason Silver of LinkedIn for inspiring us. For more information, click here to view Silver’s PowerPoint presentation to SFPRRT.